PremierSoft was founded in November 2004 by leading businessmen and respected executives with extensive experience in enterprise soﬅware and services. Their goal was to establish a leading soﬅware house to provide the market with top-of-the-range standardised and custom-made soﬅware, accompanied by training and implementation, consultancy, maintenance and support services. PremierSoft has become established as one of the most dynamic companies in the industry offering state-of-the-art, yet easy-to-use solutions designed to optimise business processes and reduce operating costs. The company’s main objective is to provide support, prompt response and efficient use of all technologies and tools. A strategic move led to an exclusive partnership with E.C.S. E-Soft Business Software Ltd so as to develop appropriate soﬅware to cover the individual needs of clients, whilst ensuring consistency of quality. This collaboration provided the power to successfully serve clients all over Cyprus and to capitalise on best available technology, functionality and internationally accepted industry practices. Our company has grown because of a competent and effective staff structure that always delivers the most efficient solutions at optimal cost and more importantly because of client satisfaction. Our philosophy is based on the fact that the IT infrastructure of an organisation should incorporate all management information, monitoring and supervisory operations, thus simplifying procedures and increasing productivity. 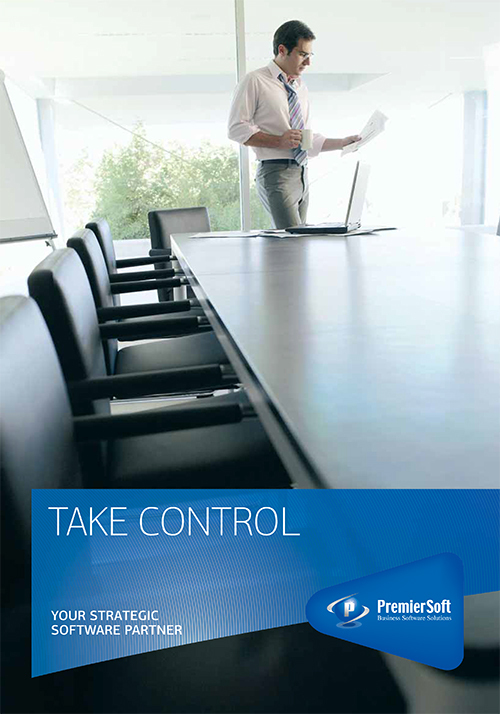 PremierSoft constantly upgrades its products and services to meet the ever changing demands of clients and the market. For the company, adherence to the vision, constant targeting, and proper planning are the three foundation stones upon which it bases its operations. Our mission is to transform our knowledge and experience into value for our clients, by providing technologically advanced soﬅware systems combined with quality services in order to optimize IT spending, ensure maximum performance and to continually increase the level of client satisfaction. Our vision is to enable our clients to achieve financial freedom and become ‘best-run’ businesses by gaining the insight and flexibility needed to operate more productively and to make more informed decisions in order to tackle financial challenges and enhance their competitiveness. We aim to retain our leading position as one of the main providers of soﬅware applications and to reinforce our passion for creativity, innovation and development. PremierSoft presents, designs and develops exceptional soﬅware solutions that offer clients the possibility of multiple utilization of business information, and in addition, provide comprehensive and reliable services. The company’s development team has successfully created many applications that provided solutions to companies that had difficulties in managing their specialised needs. Key managers handle project planning, organisation and resource management – by applying a methodology focused on minimum risk, maximum results, as well as on-time and on-budget project delivery – in order to fulfil the specified objectives of each project. In addition, PremierSoft has a team of highly experienced support professionals who are available to provide clients with unique services in the field of IT consultancy, implementation, training and technical support. PremierSoft guarantees clients a professional soﬅware package as well as timely and reliable support.